Last weekend, I found refuge from the heat at the movies downtown. Being the adventurous person I aspire to be, I passed up on “Sully” starring Tom Hanks and instead decided to watch nWave Pictures’ latest release, “The Wild Life.” Having seen the trailer before, I knew I was being treated to a group of talking animals based on the shipwrecked novel “Robinson Crusoe.” What I didn’t know was that I was about to witness a movie that belongs in Walmart’s $5 bargain DVD bin. Titled as “Robinson Crusoe” in all markets except the United States, the Belgian-French animation is a loose adaptation of Daniel Defoe’s classic novel, but from the perspective of the island’s animals. Crusoe (Yuri Lowenthal) boards a ship with his loyal dog, Aynsley (Doug Stone), wanting to explore the world beyond the nearby seas. Miles away, in an uncharted island, a parrot named Mak (David Howard) has the very same dream. With a wild storm tearing the ship apart, the crew escapes on a boat and leaves Crusoe behind to wash ashore on Mak’s island with Aynsley. With the outside world right at their doorstep, Mak and his friends venture to the shore questioning whether the new guests are friends or foes. But when a pair of nameless cats survive the shipwreck and trick Mak’s friends into turning against Crusoe, no one is safe. Even after failing at their first attempt to take over the island and kill Crusoe, the evil cats escape to a nearby island, start mass-reproducing, and assemble an army of cats for their ultimate revenge. In the meantime, Crusoe begins building a house on the island while the animals learn to adapt to his lifestyle. You may think that having Defoe’s novel as the source material should provide “The Wild Life” with enough substance to overcome its shortcomings. But by erasing all the mature themes in favor of a kid-friendly showcase of 3D effects, the movie quickly deteriorates into a set of generic events taking place one after another with no foundation or reasonable progress. In one of the few intimate scenes, Crusoe sits alone on top of a beacon he built, hoping for a ship to notice and rescue him. This could have been the pivotal moment in which the audience begins to emphasize with Crusoe and understand how he might have felt living far from home. Instead, the audience is treated to a simple observation from Mak’s point of view. This is not to mention the numerous plot holes that can confuse even the youngest kids among the audience. To name a few, when Crusoe first arrives on the island, he repeatedly struggles in making a small shelter out of a few pieces of wood. Less than an hour later, Crusoe is living in a giant treehouse and enjoying an advanced plumbing system delivering fresh water to his house. Regardless of how Crusoe was magically provided with finished lumber and construction tools, his sudden ability to build such complicated and massive structures is attributed to the help of the island’s animals, which is hard to believe even in a universe of talking animals. The best animated films with animals in leading roles give these characters a sense of humanity with nuanced emotions and complex choices to make. This is not something you’ll find in “The Wild Life.” The animals quickly change their minds without thinking, turning against Crusoe, or trusting him wholeheartedly in the blink of an eye. Except for Mak, who narrates Crusoe’s tale and his evolving view of the world, character development is nonexistent here. All other characters are either one-dimensional stereotypes or soulless animated objects, with a voiceover cast in charge of delivering a blend of tasteless jokes and dull conversations. If there is anything to enjoy about “The Wild Life,” it would be its quirky animation and character design. While the animation is by no means on par with those of Pixar or DreamWorks, nWave succeeds in delivering a few enjoyable chase sequences considering the mere $13 million budget for this production. Unfortunately, with the majority of the movie taking place on the beach, most of the screen is either filled with drab backgrounds of sand, water, or empty space. If you are looking for a Robinson Crusoe meets “Rio” combo, “A Wild Life” lacks the vivid colors, details, and aesthetics that made the latter successful in the first place. Surprisingly, “The Wild Life” is scored by Ramin Djawadi, best known for his masterful work on “Game of Thrones.” During a few long shots showcasing the landscape of the island, the score elevated the experience and compensated for the lack of vivid imagery. Elsewhere, it felt disconnected and incapable of integrating itself into the scenes. 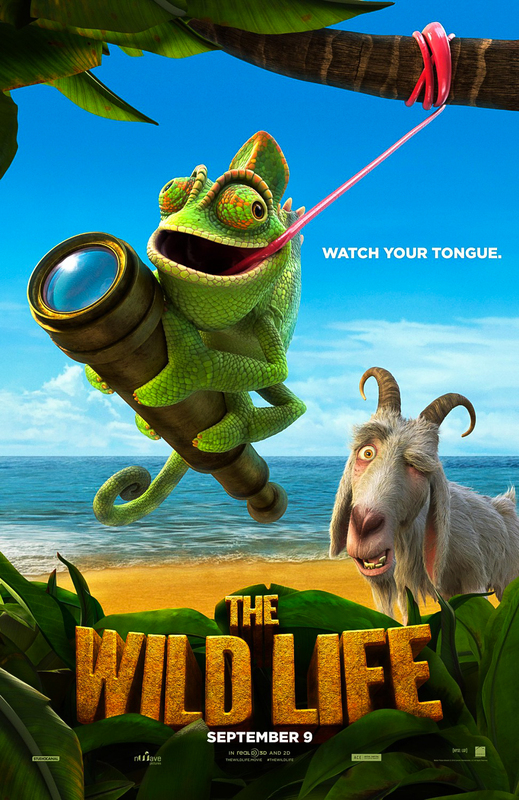 “The Wild Life” could have been about any random person stranded on an island, and it was rightfully stripped of its original title when released in the States. With little to no references to the novel that you may have grown up reading, Robinson Crusoe was chosen as a bait to lend some dignity to what is ultimately a disgrace to Defoe’s masterpiece. If you desire to watch an animated feature in theaters this week, do yourself a favor and see “Kubo and the Two Strings,” or even “Sausage Party.” “The Wild Life” deserves neither your time, nor your money.